This beautiful ruin illustrates the condition of decline, which is the general meaning of the term decadence. In fin de siécle Europe, the Decadents were a group of artists who took pride in being called "decadent" and adopted the term as the name of their movement. Oscar Wilde was the most prominent of them. He paid a high price for his "decadence" by being sent to jail for allegations of homosexuality. An example of 20th century decadence is La Grande Bouffe, an Italian film which scandalized audiences when it was released in 1973. Audiences were shocked by its tale of four world-weary middle-aged men who decide to gorge themselves to death in one final orgiastic weekend full of gourmet food, call girls and a hefty, lusty schoolteacher. Being in a state of decline or decay. Marked by or providing unrestrained gratification; self-indulgent. Decadence generally refers to the supposed decline of a society because of moral weakness. The favourite example of this is ancient Rome, where, the story has it, a great empire was laid low by wicked emperors like Nero. However, the more dissolute emperors (Caligula, Nero, etc) ruled hundreds of years before the end of the empire. 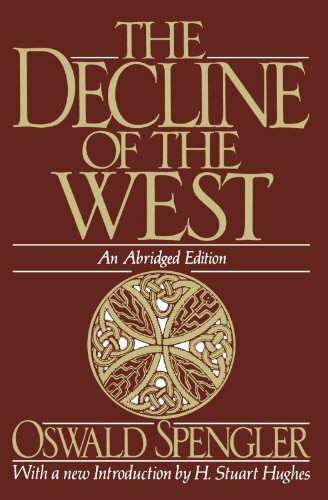 Since its first publication in two volumes between 1918-1923, The Decline of the West has ranked as one of the most widely read and most talked about books of our time. In all its various editions, it has sold nearly 100,000 copies. A twentieth-century Cassandra, Oswald Spengler thoroughly probed the origin and "fate" of our civilization, and the result can be (and has been) read as a prophesy of the Nazi regime. His challenging views have led to harsh criticism over the years, but the knowledge and eloquence that went into his sweeping study of Western culture have kept The Decline of the West alive. As the face of Germany and Europe as a whole continues to change each day, The Decline of the West cannot be ignored. The abridgment, prepared by the German scholar Helmut Werner, with the blessing of the Spengler estate, consists of selections from the original (translated into English by Charles Francis Atkinson) linked by explanatory passages which have been put into English by Arthur Helps. H. Stuart Hughes has written a new introduction for this edition. In this engrossing and highly controversial philosophy of history, Spengler describes how we have entered into a centuries-long "world-historical" phase comparable to late antiquity. Guided by the philosophies of Goethe and Nietzsche, he rejects linear progression, and instead presents a world view based on the cyclical rise and decline of civilizations. He argues that a culture blossoms from the soil of a definable landscape and dies when it has exhausted all of its possibilities. The Decline of the West (German: Der Untergang des Abendlandes) is a two-volume work by Oswald Spengler, the first volume of which was published in the summer of 1918. Spengler revised this volume in 1922 and published the second volume, subtitled Perspectives of World History, in 1923.